allis Mackay (1852-1907) was the son of the Rev. J. W. Mackay, President of Methodist College, Belfast; but by his own account in a letter to the Times he was born in Dublin, and proud of it. A writer and journalist as well as a well-known cartoonist and illustrator, he produced a "comedietta" or farce, entitled The Way of the Wind (1876), which had a good run at the Globe Theatre (O'Donoghue 283), and a travelogue recording his adventures in Africa, The Prisoner of Chiloane; or, with the Portuguese in South-East Africa (1890). Mackay's masthead for the Illustrated Sporting and Dramatic News, cropped from a front cover in Wikimedia Commons. Mackay and his older brothers William (b. 1846) and Joseph (1850-1889) moved from Ireland to London, where he became a contributor to Punch in 1870. He kept his attachment to Ireland, however, producing cartoons for the short-lived Dublin magazine Zozimus (1870-1872) as well (see Bowen 5). Then, having designed the masthead for the new Illustrated Sporting and Dramatic News, which was founded in 1874, he illustrated its "Captious Critic" column, for which he was the original writer. According to the actor John Barnes, his "inimitable drawings with their clever and delicate sense of caricature did much to establish the success of that paper" (76). From 1880, Mackay contributed to the Illustrated London News, and from 1893 was a contributor to Punch's rival, Fun. According to the Irish Comics Wiki, other publications to which he contributed included Judy and John Bull. Left to right: (a) Frontispiece to The Snowdrop Papers, with the listening elves looking comically bored. 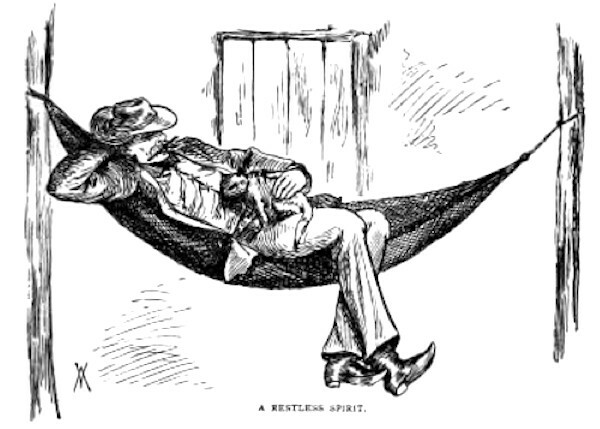 (b) "A Restless Spirit," another humorous illustration, this time from his travelogue, The Prisoner of Chiloane (p.63). 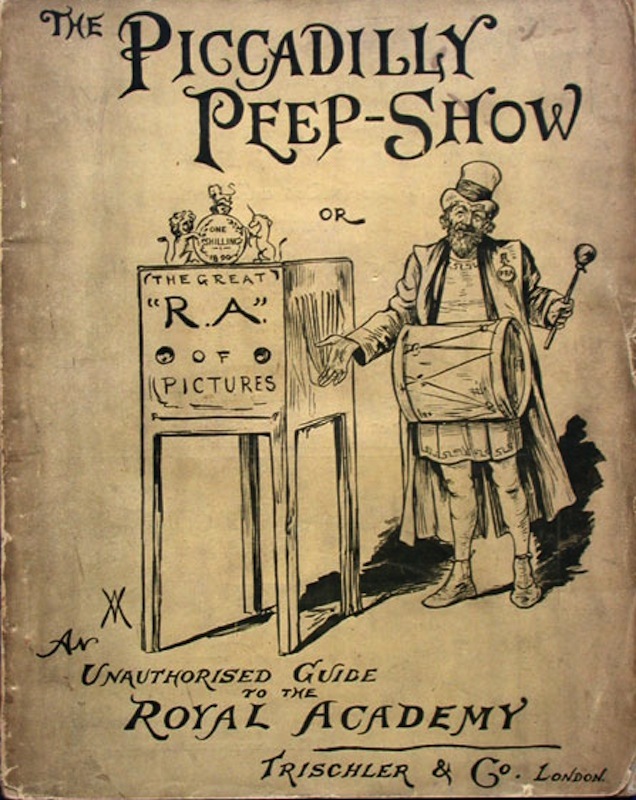 (c) His cover for the Piccadilly Peep-Show (1879), by kind permission of the Bill Douglas Cinema Museum, University of Exeter, offsite here. 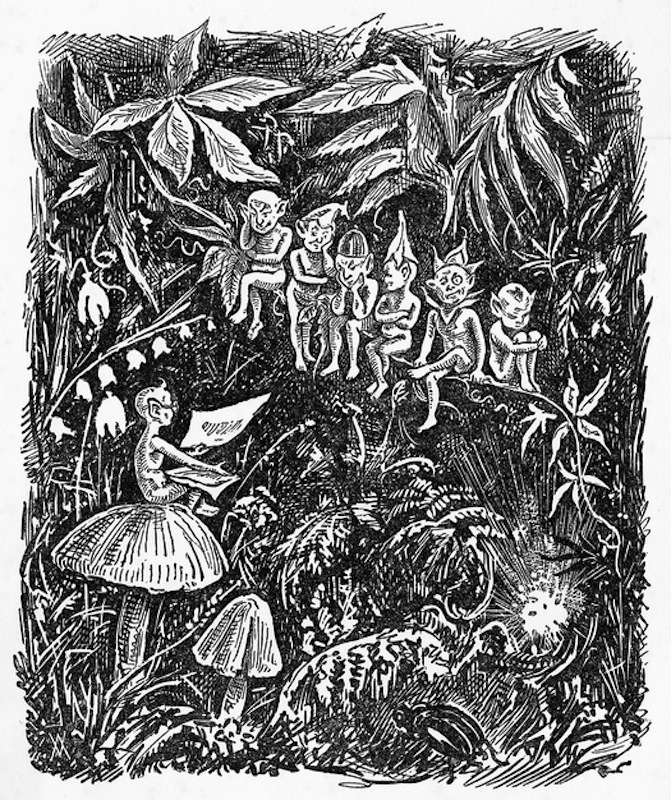 Mackay also illustrated a large number of books by other people, including The Snowdrop Papers (1877) and Father Bunny's Secret (1896) by his wife Emily Jane Nicholls, whom he had married in St Giles in 1875. Among others, he compiled the cartoon books The Piccadilly Peep-Show (1879), which, according to the Belfast News-Letter, satirised the Royal Academy exhibition with "good nature and taste" ("The Royal Academy"); and The Home Rule Pill (1893), roundly but with his usual humour attacking Gladstone's Irish Home Rule bill. Mackay signed his work with a W over an M. In writing, he also used the pseudonym "Short" (see Carty 198). Barnes, John H. Forty Years on the Stage; others (principally) and myself . London: Chapman & Hall, 1914. Internet Archive. Contributed by the university of California Libraries. Web. 3 April 2016. Bowen, B. P. "Dublin Humourous Periodicals of the 19th Century." Dublin Historical Record. 13/1 (1952): 2-11. Accessed via JSTOR, 3 April 2016. Carty, T. J. A Dictionary of English Pseudonyms in the English Language. 2nd ed. Abingdon: Routledge, 2014. "Inquest." The Times. 22 April 1907: 8. Times Digital Archive. Web. 3 April 2016. Mackay, Emily Wallis. The Snowdrop Papers. London: Remington and Co., 1877 (page images at the University of Florida). Web. 3 April 2016. MacKay, Wallis. The Home Rule Pill (text "framed by W. E. Gladstone and John Morley; glazed by Wallis MacKay"). London: Webster & Co., 1893. Hathi Trust. Copy from the University of Illinois at Urbana-Champaign. Web. 3 April 2016. _____. His horn book, for the use of greenhorns and others who would learn of the anthropophagi and divers strange things existing at the end of the XIXth century. London, J. Macqueen, . University of Illinois at Urbana-Champaign Brittle Books Project, 2011. Web. 3 April 2016. _____. The Prisoner of Chiloane: Or, With the Portuguese in South-east Africa. London: Trischler and Co., 1890. Internet Archive. Copy from an unknown library. Web. 3 April 2016. My Heritage Family Trees (entry for Wallis Mackay). Web. 3 April 2016. O'Donoghue, David James. The poets of Ireland; a biographical and bibliographical dictionary of Irish writers of English verse. Dublin: Hodges, Figgis & Co., 1912. Internet Archive. Contributed by Cornell University Library. Web. 3 April 2016. "The Royal Academy." The Belfast News-Letter. 10 May 1879: 5. 19c British Newspapers (Gale). Web. 3 April 2016. "Wallis Mackay." Irish Comics Wiki. Web. 3 April 2016. "Wallis Mackay" (Letter to the Editor stating that he was not born in Dublin, not Belfast). Freeman's Journal and Daily Commercial Advertiser, Dublin. 13 January 1879: 7 19c British Newspapers (Gale). Web. 3 April 2016.